Fun picture book alert ahead! I was so excited to be offered a copy and a spot on the blog tour. Authors are awesome. I mean really. The ability to put words together in a beautiful or interesting or funny way? Pretty cool. Add rhyming (that WORKS) and you've got an extra poetic win. Dig it, dump, dispose it day. Smooth the highs and lows it day." Busy Builders, Busy Week is a fun little ditty. It's structured through the week as the animals build ... hmmm. Do I tell? Maybe not. Only that it's a place that would delight any kiddo. I wouldn't mind visiting! They start on Sunday and work throughout the week to finish with a grand Saturday celebration. The illustrations are bright and colorful and the big eyes on the animals are my favorite. Next up will be my students! Jean Reidy is a two-time winner of the Colorado Book Award. 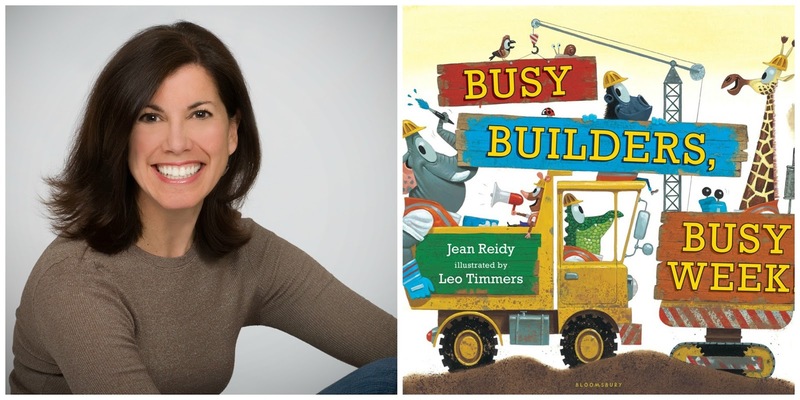 Especially gifted at writing for very young children, Jean is a frequent presenter at national and local literacy, writing,and education conferences and at schools across the country—in person and via Skype. She is a member of the Colorado Council International Reading Association and the Society of Children’s Book Writers and Illustrators, and she serves on the board of Reach Out and Read Colorado. Jean writes from her home in Colorado where she lives right across the street from her neighborhood library, which she visits nearly every day. Visit her at www.jeanreidy.com and on Twitter: @JeanReidy. Teachers and teacher librarians, click here for a free classroom curriculum guide and storytime kit! You can see past reviews and one more tomorrow right here! Follow Jean on the BUSY BUILDERS, BUSY WEEK! tour!